The Scissor Sisters' first album, recorded in a Manhattan apartment, sold three and a half million copies worldwide. The follow-up, Ta-Dah, sees them expanding their horizons, while keeping their DIY ethos very much intact. It's Babydaddy's 30th birthday. Normally this is a time to relax with friends and family, and take stock of one's life, but all this is far from the American's mind. Instead, he's standing in a rehearsal room somewhere in London, speaking loudly into a mobile telephone, desperately trying to keep his head together while ignoring incessant interruptions from noisy trains and humans. The latter are mostly urging him to get off the phone and join the rest of the Scissor Sisters, who are eager to begin their rehearsal. For 26 heroic minutes Babydaddy manages to ward off these powerful distractions, and sticks to the job at hand, which is to talk to Sound On Sound. Under normal circumstances this is not too overwhelming a challenge, but these are not normal circumstances. Right at this moment the Scissor Sisters are arguably the hottest thing in Britain. The reason is the imminent release of their brand new album, Ta-Dah. Since releasing their eponymously titled debut, the UK's best-selling album of 2004, the band have raked in a record-breaking three Brit Awards in 2005 and a swathe of hit singles, and there were several memorable performances, including an appearance at the Live 8 concert in London. In addition, a few days after Babydaddy's SOS interview, the Scissor Sisters took the Bestival festival at the Isle of Wight by storm, and the first single from their second album, 'I Don't Feel Like Dancin', stormed to number one. Babydaddy is clearly in his element when talking about writing and recording the band's music. "I am interested in people knowing that this is possible for anyone," he hollers down the telephone. "You don't need expensive tools to make this happen." Babydaddy, aka Scott Hoffman, born September 1, 1976 in Kentucky, is expressing his pride in the fact that Scissor Sisters, the band's first album, was recorded and mixed almost entirely at his studio flat in Manhattan, on a collection of Logic/G5-based gear that's unlikely to impress the average SOS reader. Three and a half million album sales later, the band's bassist, guitarist, main songwriter and tech-head gleefully announces that he has done it again: Ta-Dah is largely written, programmed and recorded by him, using almost the same collection of budget kit. Photo: Kevin TachmanHowever, this time round there are a few crucial differences. "Initially we continued where we'd left off with the first album and began working in my apartment," explains Babydaddy. "We wrote a couple of songs there, one of which, 'Might Tell You Tonight', ended up on the new album. But it was getting too much for me to wake up in the same place as where we were working. I was like 'OK, we've been on the road for a year and a half, and I deserve to have my life back.' So we found a rental space nearby that was already soundproofed and that had two small live rooms, which is more than we ever had or needed. We moved everything from my apartment there, so technically the setup wasn't very different at all, it was just set in a quieter and more comfortable space." The Scissor Sisters christened their new studio Discoball Jazzfest, hinting at the band's utterly promiscuous (ab)use of zillions of different musical influences, ranging from disco to soul to music hall to prog rock and even, indeed, jazz. From Pink Floyd to Meatloaf, David Bowie, the Beatles, Bee Gees, Andrew Lloyd Webber and Abba, the band are wilfully blind to notions of musical cool, and delight in concocting musical collages verging on the pastiche. The difference, this time round, is that they actually had the chance to work with some of their influences. "We did a session with Elton John in Las Vegas," recalls Babydaddy, "and out of that came the track 'Intermission'. A month later he came to our studio, and with him on piano and me on guitar we messed around and recorded the basis for 'I Don't Feel Like Dancin'. It was amazingly quick to work with him, a very immediate process. Music is coming out of him all the time. And he clearly is very used to performing and then having other people put the production together afterwards. 'I Don't Feel Like Dancin' was very important to us, because we really wanted to have a breakdance song on the album, and once we had it, we felt like 'Now the ballads and the straight-up rock tracks also have a reason to be there.'" According to Babydaddy, the equipment at Discoball Jazzfest consists of a G5 Mac running Logic Pro 7 with assorted plug-ins including the Native Instruments Komplete package, Korg's Legacy Collection, Arturia's CS80V and Gforce's Minimonsta. Hardware includes the Access Virus Indigo and Virus Polar, Roland XV5050, Studiologic SL880 master keyboard, Roland Juno 106 and Novation K-station synths. The band's main microphone is a Neumann M149, which went through the studio's HHB Radius 50, Avalon VT737, or Universal Audio 6176 preamps, and then into their MOTU 828 MkII, with monitoring taken care of by Mackie HR824s. "I mainly used the Virus Polar on the new album, it's my favourite keyboard," comments Babydaddy. 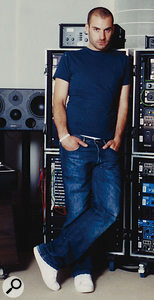 "I also still use the Indigo, which was the basis for the song Jake and I wrote for Kylie Minogue, 'I Believe In You'. We definitely use a lot of the Arturia and Gforce plug-ins, and I absolutely love the Arturia CS80 and Minimoog. I sort of like the Arturia for the bass sounds, but... I can't remember whether it's the Minimonsta, but one of these things is also great as a synth, because of the polyphony. So it's also good for pads or leads. I don't actually use the K-Station so much any more these days. "I love to use the Viruses for bass, and one of our favourite applications is to mix it in with real bass. A lot of our songs start with real bass, and I like the idea of giving them a bit more grit by putting a synth bass on top of that. Some songs don't have any real bass on them at all. It's whatever works. I used to love the Native Instruments B4, but I got frustrated with NI because their registration keys were messing up my laptop all the time. You can put in my public complaint here! So I've been switching to the Logic B3 whenever I can, and it sounds pretty great." For the rock tracks, the Scissor Sisters' core songwriting duo, Babydaddy and singer Jake Shears, enlisted David Bowie's guitarist Carlos Alomar. Together the trio wrote the songs 'Lights' and 'Paul McCartney', the latter of which initially appeared in Shears' dreams. "We had been friends with Carlos for a while," remarks Babydaddy. "He was teaching Del [Marquis, the band's guitarist] years ago. We like the idea of bringing people in to see what inspiration hits us. This was one of those where we were sitting around and he was playing bass, and we constructed this little track together. "Generally how we write is Jake and I messing around with drum beats, maybe a bass line or piano line. Very often we loop stuff to give us a template. We don't use other people's loops, although we do feel it's OK to just use sounds, and sometimes that can add a gritty vibe that will inspire something. We usually build up a foundation, getting good grooves, or a good chord progression that we may loop without any drums at all. But it will give us an idea of where to go with the melodies and the structure of the song. And then other band members may add stuff, like Ana [Matronic] co-wrote 'Kiss You Off'." The new album reflects the band's love of all things glamorous...Photo: Kevin TachmanBabydaddy constructs his drum loops in Native Instruments' Battery, in Logic. Diving into a description of the tools of his trade he manages, while continuing to raise his voice, to come up with a fairly comprehensive list (see box). "I have no interest in Pro Tools," he says. "I like gear that's ready to go and that's accessible. Logic is what I started on, and I have used it for a long time. When you use Pro Tools you're kind of stuck in that world, but with Logic you have so many options. For instance, I can use the soundcard that I want: we had the MOTU 828 Mk2 in our studio, and we also used the MOTU 24 I/O during the recordings. We set Logic to 44.1/24-bit; I'm not sure whether 24-bit gives me a better sound, but I thought that since we had the ability, we might as well do it." In tandem with Logic the Scissor Sisters use many soft synths, for the most part in preference to real instruments. According to Babydaddy, this reflects the band's ethos of juxtaposing opposing musical styles and sounds, while the plasticky aspect of some soft synths perfectly embodies the band's tendency towards pastiche and kitsch. "Pastiche can mean thievery," reckons the songwriter, "but I love it when the word is used to describe a particular combination of instruments, sounds and inspirations. For instance, the idea of putting an acoustic guitar next to a Minimoog emulator is fascinating to me. A real Moog would probably sound amazing, but I'm not sure it would sound audibly better than what I'm using right now. "I'm interested in the challenge of making imperfect recreations sound amazing. I'm not convinced that spending more money makes things sound better. There are times when we feel it's proper to spend money hiring string players and things like that, but even then we try to do it in a sensible way. We spent three months mixing our last album in Logic, but I do think we hit our limits with that album technically. So for the new album we really wanted some new ears, to see if we had overlooked options and to try new things. We did all our rough mixes in Logic this time round, and then went out and had someone mix it for us. We were sort of in the passenger seat driving the wheel a little bit, giving our own feedback, but basically for the most part we wanted someone else to take care of the minutiae and all details of setting up a mix, while we could continue with production." Enter the young British engineer and producer Dan Grech-Marguerat, who was trained at RAK Studios in London and spent the last two years working with legendary producer Nigel Godrich — among other things, helping him build a studio in London's Covent Garden. 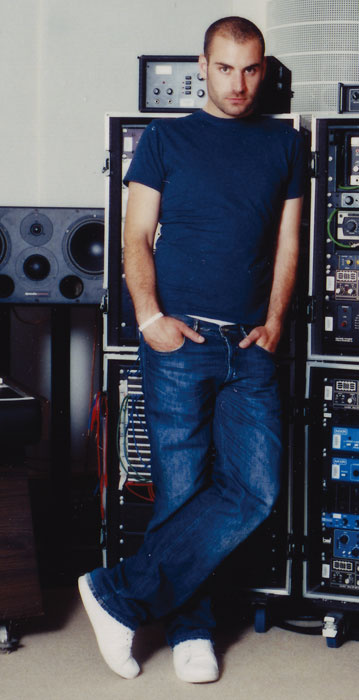 Grech-Marguerat has in his brief career collected some impressive credits, among them Radiohead, Beck, Bryan Ferry, Suede, Paul McCartney and the Hitchhiker's Guide To The Galaxy soundtrack. In the case of the Scissor Sisters he's credited with additional engineering, additional production, and mixing. "With the new record they wanted more live instruments, and they needed someone to record these," explains Grech-Marguerat. "I knew them socially, and came in to lend them a hand, and my role just kind of grew from one thing into another, and I also ended up doing the mixing. Dan Grech-Marguerat mixed the album and engineered the live sessions at Sear Sound.Photo: Kevin Tachman"The first album is brilliant for what it is, with the very stripped-down feeling of a bunch of people making an electronic record. With the new record the idea was to maintain the electronic feel, but to take it a step further, and add depth and warmth by having more real instruments. That's why I suggested that we record all the live stuff at Sear Sound, a really good studio with good rooms, a lot of vintage microphones, great analogue gear, and a Neve desk. I love electronic music and think computers are a great tool, but when recording live instruments, the more analogue equipment you use, the better the sound." While the analogue aspect of the recording at Sear Sound (see box) was relatively straightforward, a major problem resulted from the decision to keep the entire project in Logic. "My preferred way of working," says Grech-Marguerat, "would have been to record all the programming in Logic as audio, and then create a master document in Pro Tools to work with, because I find Pro Tools easier to deal with when it comes to mixing and audio editing. But they wanted to keep everything in Logic, because they were still writing and recording and wanted to be able to continue adding and changing things, even while I was still mixing. "So we had to create a mirror G5/Logic machine for me to work with, which was a nightmare. The second machine needed to have the same plug-ins and virtual instruments, so everything had to be reinstalled, and you have to have the correct licensing for each and every one of them. When you collect that stuff over a long period of time, it can be really difficult to suddenly have to recreate it all again. We managed in the end, and then it was great, because Scott could bring something over to me to work with, and it would open up and everything would run. Logic is a great tool for programming, and the more time I spent with it, the more I also enjoyed it as a mixing tool, particularly some of the automation and the plug-ins. We weren't using a TDM system in Logic, but were simply running Core Audio, in which the plug-ins take a lot less space, so we managed to run a lot of them at the same time." 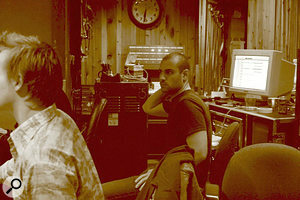 The engineer/producer conducted two recordings sessions at Sear Sound Studio A, going into his Logic system via two MOTU 24 I/O audio interfaces. 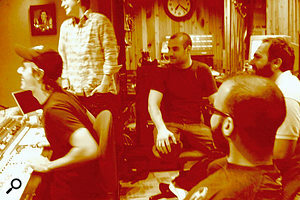 "Having regularly worked with Pro Tools, I was surprised by how good the MOTU stuff sounded. Scott was using a MOTU 828 in his studio, which only has eight inputs and outputs, and we also recorded some horns there, for which it worked fine. When I moved over to Sear Sound we needed more inputs and they wanted to keep the MOTU software as well. Thinking forward to the mix we bought two MOTU 24 I/O units, so we had 48 inputs and outputs, and I could, for instance, have 12 inputs for the drums alone." 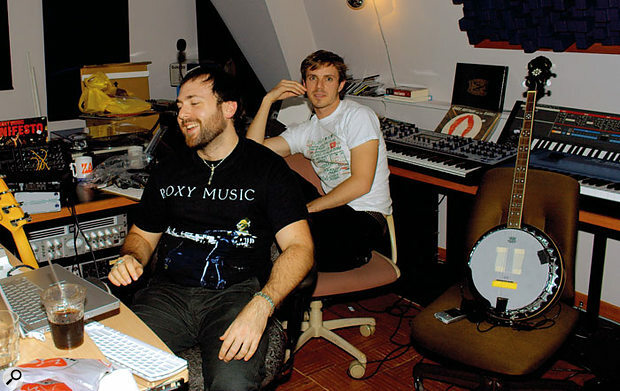 Dan Grech-Marguerat repeatedly refers to the 'analogue depth and warmth' that it was his brief to add to the Scissor Sisters record. He therefore recorded strings, piano, brass and drums at one of New York's prime vintage and analogue facilities, Sear Sound, using the studio's classic Neve 8038 desk with Flying Faders, which has 1081 mic pres as a front end. Strings for the track 'Land Of A Thousand Words' were recorded with violinist Joan Wasser, who did the arrangements during the sessions and with everyone's input. Wasser, with cellist Jeff Hills, overdubbed the different parts. The two string players were recorded with a Neumann U47 on the violin and another one on cello, plus two U47s as room microphones. "I think I also used LA2 or LA3 compressors, and I may have had Pultecs on the room microphones," comments Dan. "I recorded the drums with a Neumann FET47 on the kick, Electrovoice ND257B on the snare, Neumann 84 on the hi-hat or Shure SM57 to get a crunchier sound, Coles 4038 ribbon for overheads or sometimes a valve U47. Some of the songs had a lot of close-mic sounds, while for others I used more of the room sound. I can't remember what we had on the toms, but they were also valve microphones. Basically this was our opportunity to get as much valve as we could. Again, I used Pultecs on the room microphones. "The brass were the Uptown Horns, and we did one session at Sear Sound and the other at Discoball Jazzfest, where I used their signal chain: Avalon VT737 or Universal Audio 6176 mic pres going into MOTU 828 MkII. I used the same microphones in both places, probably Coles, because I love ribbon microphones on brass, and a stereo pair of 47s as room microphones. I recorded the trumpet, saxophone and trombone together. Isolating the three would be crazy, because the whole feel is of three guys playing together. And I don't mind spill. It's good, it's where you get air and depth from." He adds that there was a continuous to-ing and fro-ing between sessions in Discoball Jazzfest and Sear Sound, as well as between the former and the mix room. "I also did a couple of weeks at the band's studio, to help them with sounds and ideas and recording stuff. I actually started mixing before the project was finished, so they were still recording vocals and changing arrangements while I was working on songs that were ready to be mixed. We had two sets of studios to get things done more quickly." Dan Grech-Marguerat was keen to have an analogue desk available for mixing. "It's much harder to get great depth and variation in your sound when you mix purely inside the box. You can create great sounds in Logic, but if you have the ability to mix it on a desk, you can't beat that. Just running it through a Neve or SSL will already make a big difference." As a result, the Briton chose an unusual mixing venue which was entirely in keeping with the band's penchant for kitsch. "I like working on Neve VR desks, and there are only a few of these left in Manhattan. The closest by was at Manhattan Centre Studios, right next to two huge live rooms called the Hammerstein Ballroom and the art deco Grand Ballroom. To get to the studio you had to walk though the Grand Ballroom, which has an amazing atmosphere. Orchestras would be recording there, so if you needed to go out shopping you had to walk through that, which was great fun." By the time Grech-Marguerat had tracked strings, horns and drums, some of the songs had expanded to as many as 120 tracks. With only 48 ins and outs available, this meant that he had to do a significant amount of submixing within Logic, and with that, had to be very conscious of balancing outboard gear and plug-in effects. "Logic was brilliant, actually, it handled what we were doing really well, even with all these tracks. For the mix I would group things in Logic, and use Logic automation and plug-ins. Scott used plug-ins in very creative ways, and we wanted to keep these, of course. I also mixed with some of the plug-in synths running live, so we could at any point go back and change stuff, right before I actually put the mix down. When you have a lot of tracks going on and you need to group a few things, it's great to do that in a computer. Photo: Kevin Tachman For overdubs, the band and Dan Grech-Marguerat moved to Sear Sound Studios in New York.Photo: Kevin Tachman"I think the plug-ins are a great and very creative tool, even though some things sound better than others. Delay units within Pro Tools and Logic can sound brilliant, but digital guitar processors and digital distortion don't sound very good. I love the 1176, and I will always add a little bit of analogue distortion, because it can help stir up the programmed stuff, which can sound very clean. Distorting some of it can really help, and I find that you cannot beat the sound and distortion of a real amplifier. A cool thing to do is use a guitar amplifier as an effects unit: send your signal to it and hang a microphone over it. One important thing is that you can't predict what an amplifier will do to the sound. By contrast, what you do with plug-ins is very controlled. Adding a bit of analogue signal to a chain adds life and depth to things, and that's really important. "In some cases I had added plug-ins during recording for listening purposes, like compression on drums, but I would take them off again for the mix. Even though I did a lot of automation in Logic during recording, programming and arranging, wherever possible I would ride things in the Neve's Flying Faders. It still is my preferred way of working. I can add various kinds of delays and distortions and reverbs and so on, and for me it's fun doing that on a desk. I have the ability to split everything out over the desk, and can tweak each sound and each EQ, and add effects, like my favourite AMS delay unit, which has great delays, and the RMX16 gives great-sounding reverbs and sounds great on vocals. "Babydaddy and I knew Logic really well, so while I was engineering, it was mainly the two of us during the mix. I actually mixed to Pro Tools, at 96kHz, because it was the easiest to do, and I could do some edits in it. But adding live stuff over programmed stuff works really well, and mixing it on a Neve was a good way of gelling everything together. We were never scared of Ta-Dah being a full-scale electronic record with four-to-the-floor kick drums and programmed hi-hats. The Scissor Sisters are a band with a big electronic element. In the mix I treated it all the same, whether it was somebody playing a synthesizer or a violin. The bottom line for this record was for me to retain the band's electronic essence, and add warmth and depth by recording live instruments and using analogue equipment. I think we achieved that mixture."